Last month we opened up our kit we received in the mail from Kelly Kits. Kelly Kits is a kids craft subscription that you can get delivered to your home monthly. Best part about this subscription is that it's fairly inexpensive. For just $9.99 per month you will get a little cardboard pod filled with all the elements for a really fun craft project. Teaching your children to be creative is a special experience that I believe all parents should try to work into their day to day routine. Creativity can open up a whole new world for a young and budding mind. Please enjoy the photos below of our Kelly Kits experience. Our theme was Printmaking. All the contents, they fit a lot in there! We cut out unique shapes from the sponge material. It was fun to get the shapes wet and watch them puff up. Here we are soaking the in the tempura paint. Carefully placing the shapes over the paper made a really fun effect. We had so much fun making prints! My daughter is going to make cards out of the papers we printed on and one I saved for the fridge to liven it up for a while. Our kit also came with an instruction card with an enrichment idea to adapt the art activity to a school lesson, this could be especially helpful for homeschoolers. Mama Nibbles has the privilege of giving away 1 full year of Kelly Kits ($99.90 ARV)! Every reader that enters will also be given a code to receive a FREE Kelly Kit a $9.99 value (there is a one-time $2.49 shipping fee). Readers have no obligation to get the kit it is completely up to you if they want to take advantage of the FREE kit offer, it's just their way of thanking you for entering the contest! 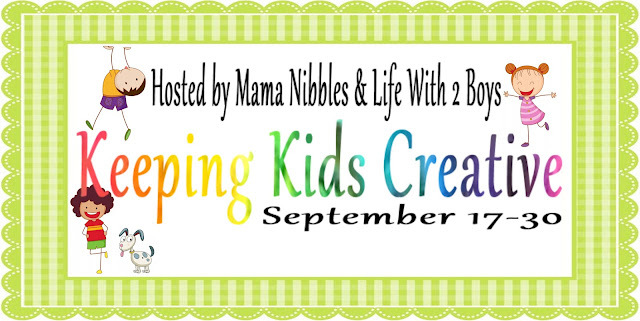 Kelly Kits will ALSO be sponsoring part of the Grand Prize for Keeping Kids Creative! We will be giving away another full year subscription. Be sure to check back on September 17th to enter to win this and much more. *I received one or more of the products mentioned above for free. Regardless, I only recommend products or services I use personally and believe will be good for my readers. MORE policy info here.